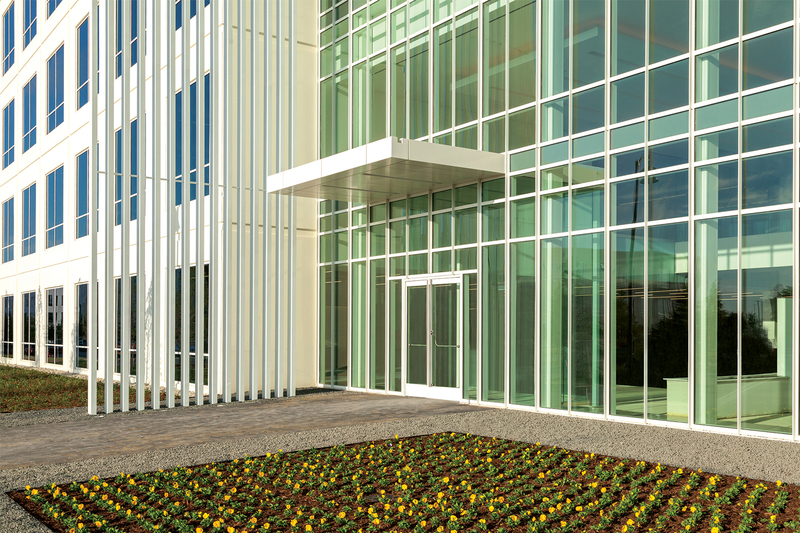 Entrance systems with all-glass visuals are in demand, and for good reason. Less metal and more glass translates to improved daylighting, unobstructed views, and a contemporary aesthetic. The problem is that stringent energy codes often compel architects to specify full-framed thermal doors at the expense of aesthetics. With codes on their current trajectory, the future of glass entrances can very well be thermally broken systems with insulating glass (IG). Traditionally, IG units go hand-in-hand with wide-stile thermal doors. Although these systems provide great performance, they lack the high-end appearance of an all-glass entrance. The good news? Some manufacturers have been listening. The industry is seeing much needed innovations in glass entrance design. CRL-U.S. Aluminum, for example, has released its Entice® Entrance System, which features ultra-narrow 1-1/8” vertical stiles, 1” IG units, and thermally broken framing and cladding that delivers U-factors as low as 0.33. In essence, the system provides all-glass aesthetics and the full-frame thermal performance required to meet codes, including California Title 24. The system also has the unique ability to support handle hardware—including panic devices—on 1” IG. Energy codes are evolving; however, by understanding the role insulating glass will play in glass entrance design, and the product innovations available, you won’t have to specify performance at the expense of aesthetics again. The groundbreaking Entice Panic Device by Blumcraft® features a patent-pending design with an independent, ultra-narrow horizontal crash bar that’s engineered to easily and securely attach to the vertical panic component. This unique 2-piece system means that for the first time, architects can specify a panic device with in-demand, back-to-back ladder pulls. The Entice Panic Device can be mounted onto both monolithic tempered glass and double-glazed insulating glass using proprietary through glass fittings. The Entice Panic Device will make its premier at the 2018 AIA Expo in NYC, June 21-22. Visit C.R. Laurence in booth 1945, Level 3. Learn More.